Want to give some ba-da-bim for your home for Halloween? 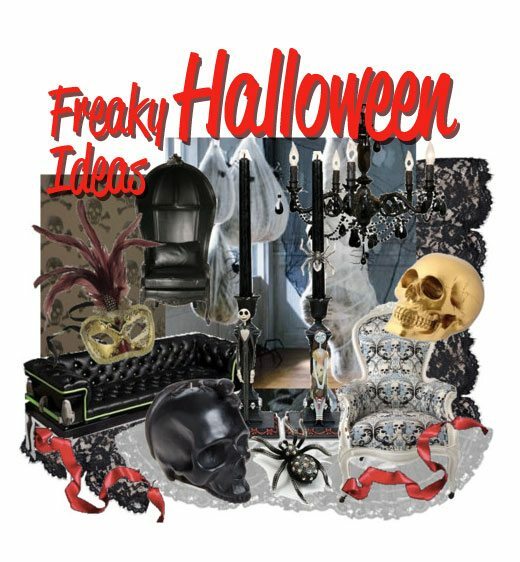 Here are some gothic, spooky and just fantastically Halloweenish ideas for taking your Halloween decorating over the top this year. Some of these finds might fancy you so much that you’d might like to keep them year round. Especially is you live in a gothic castle. Or you are a vampire. I adore the modern Thomas Keeley chair and its modern look. Simple and stylish. 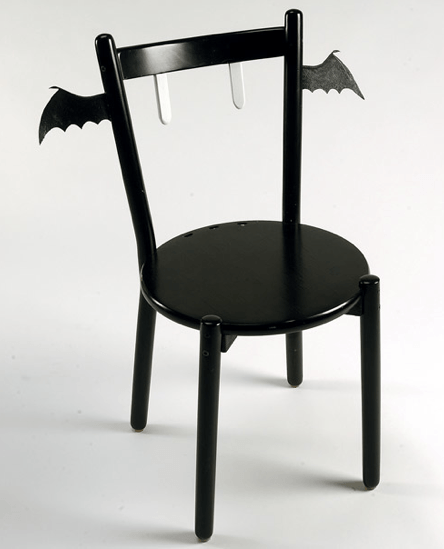 Maybe you could even rig your own chairs with bat winds to get the look? 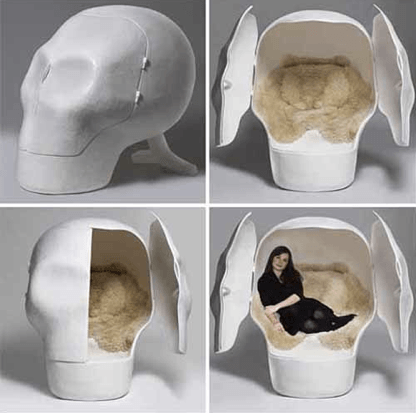 If you are looking for a more like a relaxing chair for lounging, the sensory skull chair by Atelier Van Lieshout might do the trick. Treat yourself with this skulltastic chair, which allows your “body to relax -and- escape the sensory clutter of modern life.” Now that sounds nice, doesn’t it? But how you’d like that big skull in your bedroom? 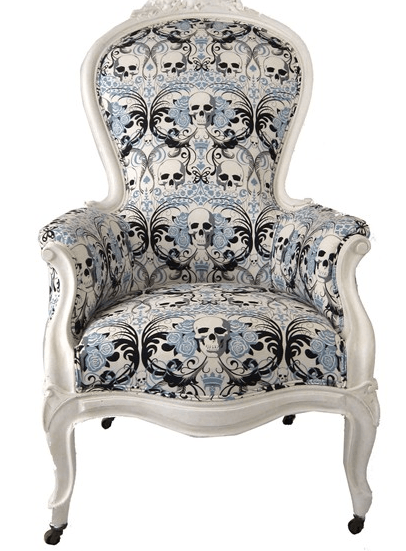 If the above chairs are too modern maybe you will like this Victorian Skull Chair by VandM better. The Victorian chair comes in pink and blue upholstery, perfect for the king and the queen of your castle. Ever wondered how it feels to lay inside a coffin? Well, me neither. 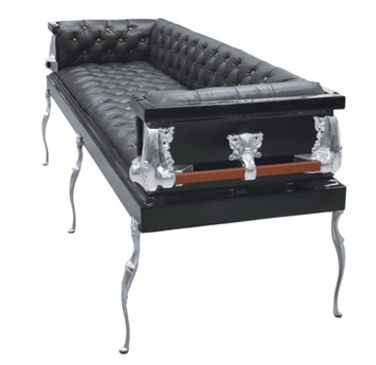 But if you now started wondering, Coffin Couches have a solution for you. Their coffin couches allow you to lay on the couch watching TV in our own home while offering you the authentic coffin experience. The best – they can be even customized by your favorite sports team. Or scratch that – what the heck – why would you want to have your favorite sports team all over a coffin? 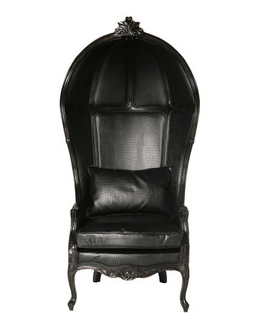 OK, that just got way too weird, so let’s feature one more chair… The French Bedroom Company’s throne chair will lure anyone to be the king of the house. 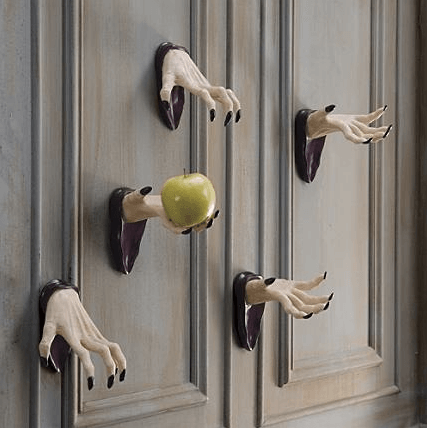 Wall mounted hands from GrandinRoad give a nice welcoming touch for trick-or-treaters right in your foyer. 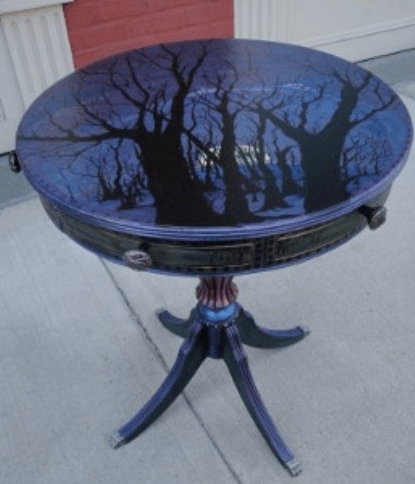 This round painted table from ImagineThat2010 sure pleases anyone who has lost that haunted feeling in their home. I prefer this ghost table though. Everyone keeps talking about the ghost chairs but I feel ghost tables don’t get the attention they deserve. Rockett St George has several different styles, wouldn’t they be pretty floating around your home? Rockett St George also sells this fabulous skull wallpaper. Did you know that it only takes one weekend apply wallpaper in your living room? There is still time before Halloween. Last but absolutely not least. Ah, the hanging cocoon man. 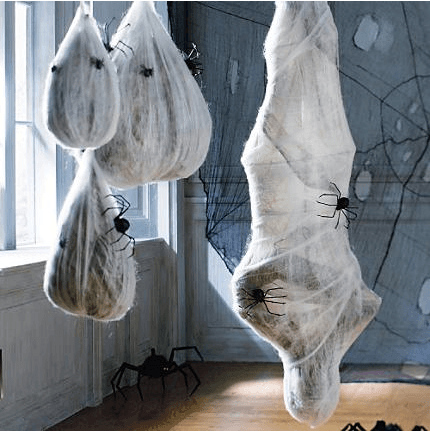 Halloween just doesn’t feel the same without a hanging cocoon man in your living room. Of course accented with a few spider larva balls for the authentic look. From GrandinRoad. Note: don’t try this with your husband. He might come handy helping you to strip down that skull wallpaper before Thanksgiving. Photos: the respective designers & stores, linked above.